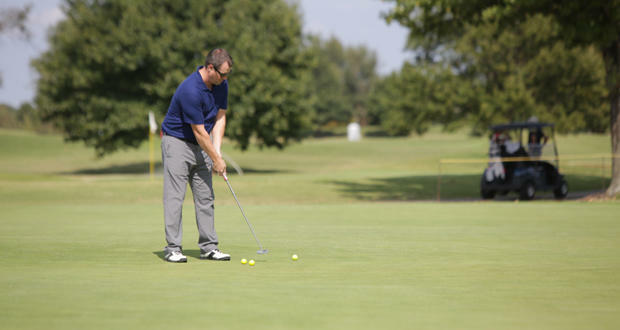 A man practices his putting at Lincoln Park Golf Course in Oklahoma City. Organizations that hold golf tournament fundraisers say they are still an effective way to raise money, even though fewer young people are golfing. Mark Fiscus, the general manager of the Tulsa County Country Club, said his club added two additional tournaments for non-profits this year. The Journal Record’s Molly Fleming writes they typically host eight to ten tournaments per year. Those non-profits include the Make A Wish Foundation, the Boys and Girls Club and the Tulsa Area United Way. A fundraiser hosted in early October netted more than $100,000. Fiscus said that’s not a typical amount in revenue. “A golf tournament is a wildly successful fundraiser,” he said. The American Institute of Architects (AIA) Central Oklahoma chapter has hosted a fundraising golf tournament for at least 22 years. Executive director Melissa Hunt says the event sells out every year, but she wonders how long the tournament can continue as a fundraiser. The tournament raises about $1,000 annually. Fewer millennials are golfing. Over the past two decades, the number of 18 to 34-year olds who golf has fallen by 30 percent, according to the National Golf Foundation. According to a Pew report, household changes since 1970 have taken a bite out of golf time. More homes have two income earners, there is a more equitable sharing of household chores and it’s more likely that both parents share the responsibility for maintaining their kids’ schedule. Fleming says she expected fewer organizations would hold tournaments. However, she found that they are still a popular way to raise money. “While the number has dropped since the 1990s that they seem to be holding steady,” Fleming said. The decline in interest in golf has affected real estate. Fleming says it used to be “a big deal” to live in a country club neighborhood. Fleming says more than 800 golf courses have closed nationwide over the past 10 years. The closures open up large areas of land for redevelopment, and can anger homeowners who purchased homes to be next to a golf course. “The Coffee Creek Golf Course in Edmond was bought earlier this year and could have nearly 200 homes built on it. That redevelopment will go to the Edmond Planning Commission next month. In Oklahoma City, the Westbury Golf Course is being redeveloped by Ron Walters. He's putting senior housing on the course," Fleming said. Additionally, the White Hawk Golf Course in Bixby could be sold, Fleming sold. EDITOR'S NOTE: An earlier version of this story incorrectly stated the White Hawk Golf Course is owned by the City of Bixby. We regret the error.